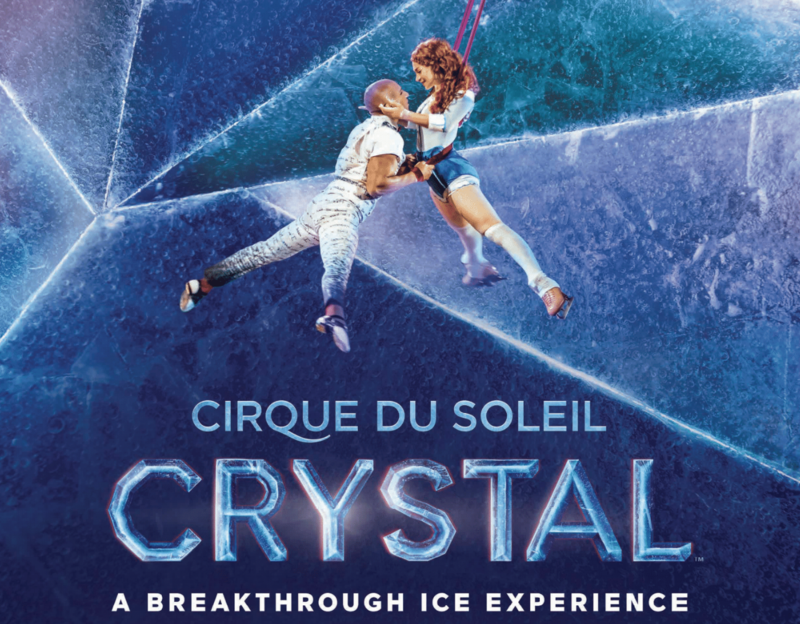 This is the 31st stop for Crystal the mixed Cirque and Ice Dancing Show from Cirque Du Soleil. They are still extending the tour past the end of the year. There are 95 performers and crew that travel with Crystal. 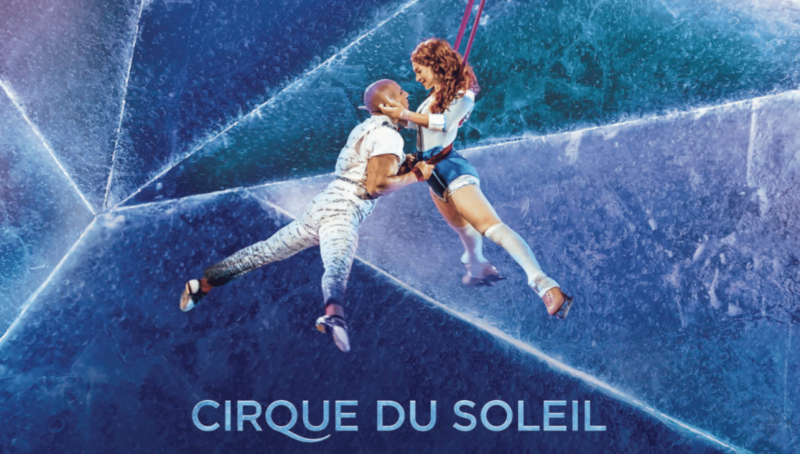 Cirque du Soleil presently has 19 shows playing including eight in Las Vegas. I spoke with band leader Steve Bach and asked him about the music in the show and his long career. The French word for show is spectacle and that’s what Crystal is in the English sense, a spectacle, a public show on a large scale. There is skating; solos, duets and ensembles, choreographed by Kurt Browning among others. There are acrobatics, juggling and, like any circus, clowning. 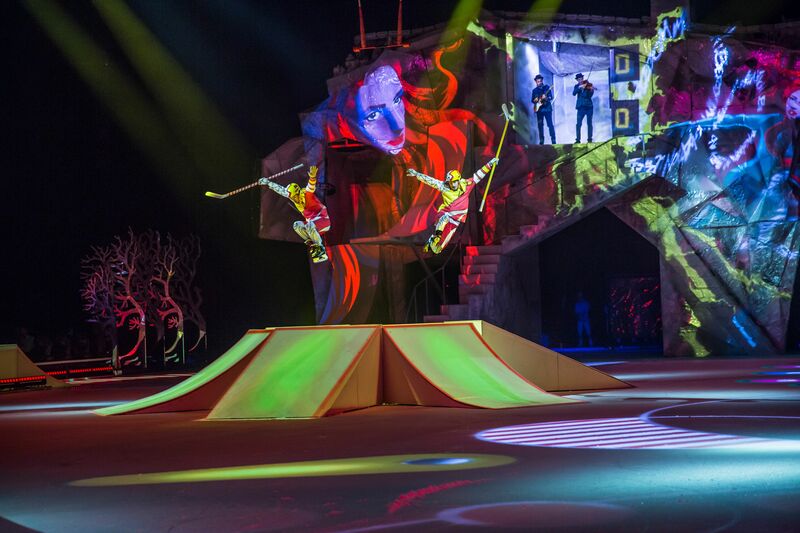 Performers move scenery around the ice surface before and during the scenes or numbers. 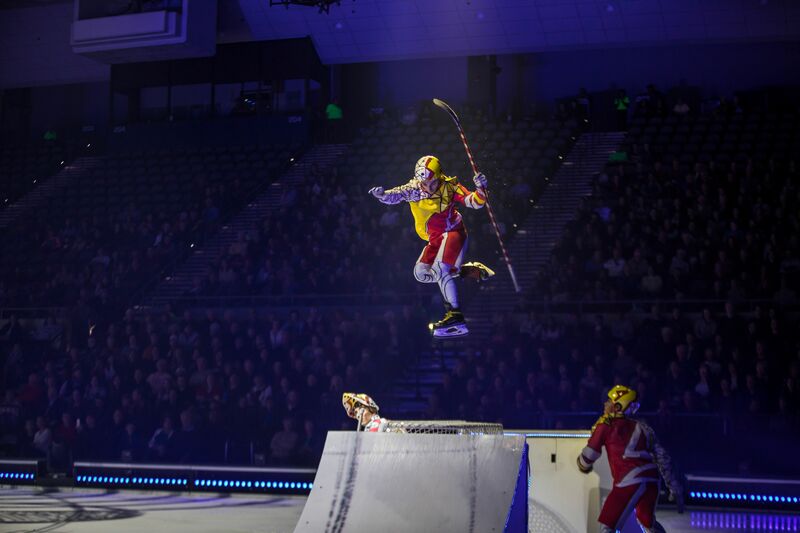 Aerialists appear from above and interact with players on the ice. Acrobats do their stunts on the ice surface and never fall down! The entire show is accompanied by a complicated and highly effective light show which includes projections on the main set at the back of the rink which help to illuminate the plot. Moreover, there’s often more than one thing happening on the ice or in the air and this distracts our attention from the players moving sets, props and equipment around. Oh, and there’s music. Non-stop music composed by Maxime Lepage. Much of it is sequenced or pre-recorded but three virtuosic live musicians, doublers all, play along and alone. The accompanying music is very ecclectic. Sometimes it echos klezmer, other times musette or popular song. At times it rocks along but most of the time, especially in the most active sequences, it is highly cinematic with booming drum tracks and lots of powerful subbass sounds that move a lot of air. The band is led by American keyboardist/accordionist Steve Bach and includes the Spanish clarinetist/saxophonist/guitarist Camilo Motta and violinist Stepan Grytsay from Ukraine. All three performers are very skilled. Bach plays piano from behind the scenes and accordion on stage. Motta, primarily a Bb clarinetist, playes Eb clarinet, bass clarinet and tenor saxophone as well as guitar (and he skates!). Grytsay is the second violinist to play with this show and, Bach told me later, arrived with the score almost competely memorized. There is a story, in fact a rather detailed plot, which was well worked out as the creative team developed the show. Its bare bones are narrated for the audience’s benefit but really, like in ballet and some opera, you’d be better off knowing the story before going to the show. Having said that, it would be very entertaining even if you didn’t get the story at all. There were lots of children in the audience and they clearly enjoyed it without really understanding what was going on with the plot. The principal roles, both a version of the girl Crystal are played by Nobahar Dadui, who is from Burlington and American Madeline Stammen. And yes, I did enjoy the show. In fact, I’ll gladly see another Cirque du Soleil spectacle when I have the chance. The next afternoon I went back to the arena and, escorted by the company’s travelling press rep through the labyrinthine passage around the ice surface, found music director Steve Bach at his set-up. I spoke to him while the acrobats rehearsed on the icy stage just behind us. Bach has had a long career as a jazz pianist. You can see and hear him play with Stanley Clarke’s band at Montreux in the early 80s on YouTube. He was subsequently the staff composer and keyboardist for Reel Music in Los Angeles. During that time he recorded 7 albums of contemporary jazz and toured with his own band. He later played with Sérgio Mendes and was music director for Andy Williams at his theatre in Branson. Steve Bach ended up, at the age of 23, playing with Stanley Clarke’s band in two incarnations, the second of which recorded the highly successful album Rocks, Pebbles and Sand. He toured with Clarke and that band for a year, traveling the U.S., Europe and Japan. The “orchestra pit” area is off to the side, very close to the ice surface but the music director faces away from the action. He is surrounded by the equipment and road cases and, aside from people who might be seated in poor seats, immediately above him, almost no audience members are even aware that he’s there controlling the live music of the show. He doesn’t stay there though since he plays, with the other two musicians, from various locations in and around the set. His accordion is a Roland V (V for virtual) is one with about 100 digital sample sets so that he can get a variety or sounds from like Tango, Alpine and Musette. It works just like an acoustic instrument. If you don’t push it, it doesn’t play. Each of the players gets a stack of pages. Steve’s is a three-ring binder of punched pages printed from a notation program. Some of the music has been struck out because the numbers or parts of them have been cut. He requested that the composer include chord symbols above his accordion part. Some of what is written, he told me, is not exactly what he plays, particularly in the accordion parts. The book rests on a stand above his two keyboards. White keys on the upper one are labelled with scenes from the show so they must work the presets. The lower one is a weighed midi controller. To his left are two video monitors. One of these displays the Ableton Live sequences, 132 tracks (although they aren’t all active all the time) and the other is a monitor of the action of the show taken from in front of the playing surface. Because all the sounds are relayed to the sound board and then the elaborate speaker system it was difficult to know what is sequenced or pre-recorded and what is actually being played live. When I asked him he told me, “When you see us out there, we’re live, we’re playing.” The acoustic instruments are miked and the sound transmitted wirelessly to the sound board. There is no bass player in the band, so most of the bass parts are pre-recorded. The easy (and cheap) way to do this would be with digital samples but Cirque du Soleil records a live player. Similarly, with a string quartet, live players were engaged and recorded in a studio. Those sequences are then placed in Ableton along with whatever percussion and sound effects. Some of sound effects are triggered from the stage, others from the front of the house to sync with the action. There are also a couple of songs and, again, the singers were recorded before the show began to tour and the live musicians supplement the recorded tracks. Only the leader ever plays from the “pit”. The other players, and Steve himself when he’s playing accordion or his giant grand piano on skates, are always out on the set with the other performers. There’s not much improvisation since the numbers are pre-recorded but there are parts, for example with the clowning, that are different each night and Steve plays those parts by ear as he watchs the performer. There are also passages during changes that need some music to fill the transition. Finally, I asked how Steve became involved with electronic pop duo Empire of the Sun. Steve played and has a writing credit on their 2013 album Ice on the Dune, and for their Platinum hit Alive. This interview has been edited for length, clarity and continuity. The original article appears here on the author’s blog “Composer’s Notebook.” It is republished here at Hamilton Musician with permission.